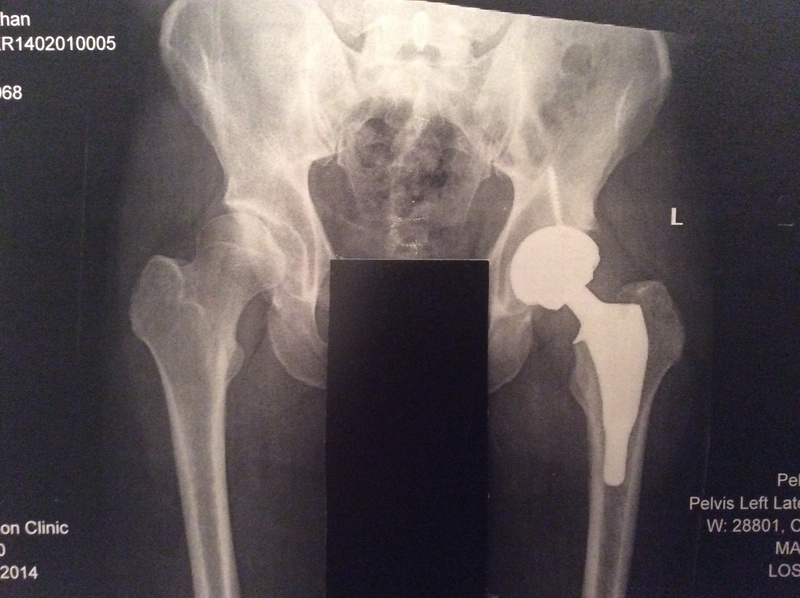 My left hip replacement – isn’t that for old people? 10 knee-raises every hour the physio says. The first one’s the killer. My 15 cm glue-sealed scar looks like a shark wound – a neat one though, like he had braces as a kid. Thankfully it’s still numb. The spinal block and other in-op painkillers are keeping the wolves at bay. It’s plus 17 hours now. 17 hours with my new ceramic-and-titanium left hip. This has been coming for 7 years. First the twinge when jogging, then the occasional shooting pain when hiking, eventually limiting walking to 20 minutes and preventing me playing with my kids. I am 45. When I told people I needed a hip replacement they invariably replied with, “But you’re so young!”. My surgeon reassures me that there are many young people, even as young as 18, who undergo hip replacement, but a brief visit to the National Joint Registry (njr centre.org.uk) informs me that the average age of people undergoing the more than 80,000 hip replacements in the UK every year is 68. What is young and old? There’s no clear line. Some people are young, but behave old. Some older people behave young. It’s a complex thing. Mental, physical, behavioural, attitudinal. What makes healthy people act old, and old people appear young? I feel young, but my hip’s been making me act old for years. It seems to me it’s all about how one approaches things. How one is internally self-motivated, and how this is communicated to others on the outside. Youth is more about how you go about fulfilling your potential than it is about chronology. It’s what you do, how you represent yourself, and how you’re perceived by others. Since starting Trading Times last year, I’ve been inspired by the vitality, motivation, commitment and drive inherent within plus50 Britain (people traditionally labelled as old, or getting there). Inspired to want to change the way this enormous demographic resource is viewed, embraced and utilised. Not inspired for pity’s sake, inspired by a genuine new-found respect. We need to change the descriptive language and attitudes, as well as the role the ‘young-old’ play in our economy and society. Redundant, old, elderly, pensioner, retiree must all be replaced by some other language that occupies this new space between middle- and old-age. 43% of the UK population is over 50. By 2024 it will be 50%. People are living longer and healthier. A typical 60 year old possesses 40 years of work and adult life experience, and is still young and driven. Old age happens later. There’s so much we can do before we get there. With more than 50% of children born today expected to reach 100, let’s not shortchange ourselves and give up two-thirds of the way through. Let’s not live a life half-lived. Let’s keep pushing, creating, persevering, inventing, challenging. So back to my hip. It might be just relief (and some traces of narcotics) talking, but it’s now day 2, and I’ve just done stairs.